The iconic Arizona Memorial was built in honor of those who lost their lives aboard the USS Arizona during the attack on Pearl Harbor that fateful day, December 7, 1941. 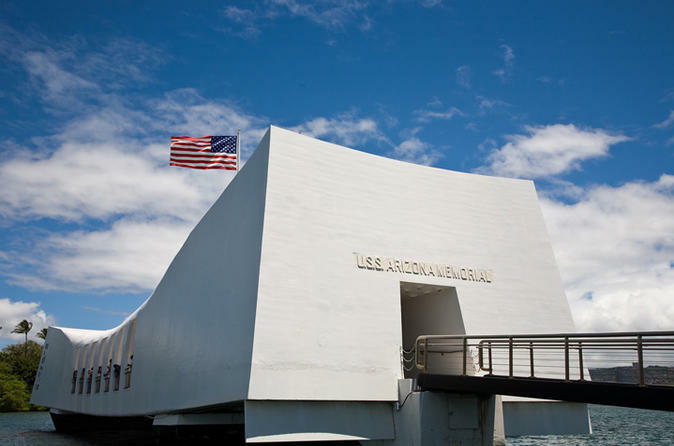 The memorial is the most visited destination at the Pearl Harbor World War II Valor in the Pacific National Monument. Before embarking on a US Navy operated boat to the memorial you will get the chance to watch real footage of the attack and gain a deeper understanding of the events leading up the attack which symbolize the start of WWII for America. Designed in a unique way to honor those who have fallen, the Arizona Memorial is built over the sunken battleship which remains as the final resting place for 1,177 crewmen. During this somber visit you will witness the “black tears” of the USS Arizona as oil slowly leaks to the surface of the ocean. Pay respects to those who have fallen in the shrine room where you can see the names of all those who have fallen during the attack. Often overlooked and underappreciated are many top attractions located in downtown Honolulu and the surrounding area. We continue our tour to downtown locations like Iolani Palace, which is the only palace on American soil along with other historical landmarks like the coral built Kawaiahao Church. Cruise through the Punchbowl National Cemetery where your professional tour guide can explain the historical significance and history of the crater.